Do you have trouble focusing at work or school or do your kids tend to zone out when they should be zoning in on their homework? If so, then you are far from being alone. Many children suffer from attention problems and there is an increasing diagnosis of attention disorders like ADHD. For many of us, we don’t always have the concentration and focus levels that we need to perform our work and others have real difficulties with their memory. There are of course many reasons why people have difficulties with attention, focus, and memory but whatever the cause, there may be a natural solution. You may have heard that there is an essential oil for everything and while it may be something of an exaggeration, it is certainly not far from the truth. Essential oils have long been valued for their mood enhancing and medicinal abilities and there is some evidence that they can also be used to improve a wide range of cognitive troubles. There is a dizzying variety of essential oils on the market today. Each oil has its own medicinal value based on the active ingredients that it contains. There is of course quite a bit of crossover so there are a number of essential oils that could potentially help improve your focus and memory whether used alone or in combination with other oils. The article will take a look at some of the oils that we feel will help you improve your focus levels and help you to perform your tasks more easily. 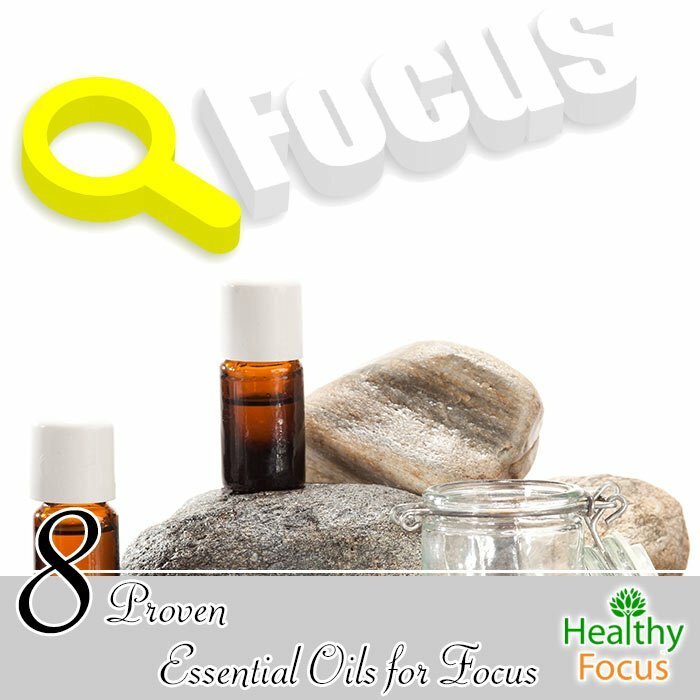 What Essential Oils Help Focus? This oil which is a native of India has been used for thousands of years for a wide variety of purposes. The sacred herb, as it is sometimes called, is valued for its uplifting and soothing properties as well as its many healing abilities. In its native India, it is commonly referred to as an oil of tranquility. As regards its ability to improve focus, vetiver is considered to be calming, stabilizing and grounding. Try diffusing it at home or applying a few drops to the soles of your feet at night. Vetiver oil is great for your focus when used alone but can also be combined with other calming essential oils like cedarwood or lavender. Rosemary essential oil with its sharp, camphorous aroma is another excellent oil that many people find can aid their focus and attention. In fact, a study published in 2003 demonstrated that rosemary essential oil could enhance your proscriptive memory and mood. Improving your proscriptive memory will help you to remember your future schedule and for anybody that forgets to pay their bills as often as I do, it could be something of a boon. The study actually investigated the ability of eucalyptus and lavender oils to improve cognition and mood in 144 healthy participants. They were separated into 3 groups and either exposed to the scent of eucalyptus essential oil or lavender oil while the control group was exposed to no odors. Try inhaling eucalyptus oil from a diffuser or rubbing it into your hands and cupping them over your face. You can also add a few drops to your evening bath. Just the sweet, refreshing scent of this herbal essential oil can help to improve your attention spans and relieve your fatigue. If you find that you need that bit of extra focus to complete your assignments or you need a bit more mental energy to prepare for your final exams, try using basil oil. Put a diffuser on your desk and let the vapors encompass your work-space and hopefully, you will have the attention span to go that extra yard. Lavender essential oil is the most popular of all the essential oils. It is especially well known for its calming properties and its ability to ease anxiety and enhance sleep. According to the same study mentioned earlier in the article, lavender essential oil can also enhance memory and improve focus. Lavender oil can be inhaled to aid focus and memory but it is also a very mild acting oil and one of the very few that can be applied topically without dilution. Dilution is still recommended in the interests of complete safety but try adding a few drops to the neck, temples or feet when you feel your focus starting to wane. The cooling, stimulating sensation of peppermint oil, as well as its rich, menthol aroma, is just the tonic that your brain needs to give it a boost of energy. It is also a great natural treatment for headaches and fatigue that may be hindering your work and studies. The warm, woodsy fragrance of cedarwood essential oil has excellent calming properties and may help you to get down to work with added focus. Like most essential oils, it is excellent when inhaled or diffused but you could also try applying a few drops to your feet and temples to give your brain even more of a boost. The citric flavor of the lemon oil is known to help ease headaches and quell nerves. If you are a fan of citrus oils, it might also be a great choice to help your focus and attention spans. Try diffusing the oil and inhaling it near your work or study space. Be careful when applying lemon oil topically as it may cause photosensitivity. When it comes to focus and attention, the best oil for you may not necessarily be the best oil for another person. Apart from the oils we mentioned above, there are plenty of other essential oil that can aid your focus and attention. These include sandalwood oil, frankincense oil, and ylang-ylang oil. Which essential oil is best for studying? What essential oils are good for attention? What essential oils are good for mental clarity? It would just be based on linalool in essential oils potentially reducing beta brainwaves (3). Excess beta waves can lead to overstimulation and irritation so reducing them can help in clarity. The best way is always going to be to try for yourself as people have different olfactory receptors and react to different compounds differently. Brain Power Blend: Brain power blend is a combination of essential oils that is used to enhance cognition including memory and focus. What Essential Oils are in Brain Power? The essential oils used in brain power are cedarwood, melissa, sandalwood, blue cypress, lavender helichrysum and frankincense. Which Doterra oil is good for concentration? Doterra inTune: InTune by Doterra is a combination of oils selected to enhance focus. What is in Doterra InTune? InTune uses a combination of lime, frankincense, patchouli, Roman chamomile and ylang ylang in its focus blend. It has a delightful aroma and may be just what you need to enhance your attention spans. Have you found that essential oils can help stimulate your memory and improve your focus levels? Which oil did you find worked the best and were you disappointed by any others. Please let us know which oils you have tried and how you got on with them. We would like to hear from you.